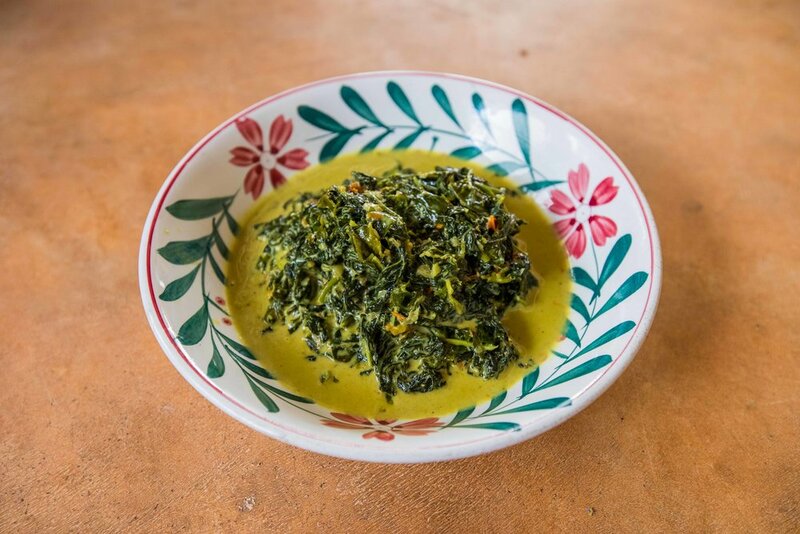 One of my most memorable days in Zanzibar was an afternoon cooking with a group of local Swahili ladies, and this dish was one of my favourites — cool, creamy spinach and coconut. Tasty enough to eat with rice but also a gorgeous accompaniment to a Swahili feast, but blend it and you've got soup. I love the versatility of this dish, as well as its simplicity. Like many of the recipes I learnt in Zanzibar, it starts with onion and garlic and is gently spiced. I quizzed everybody I met about the food they eat in Tanzania, and it seems that whilst some people were all about the chilli, it was just as common for people not to use chilis in their food and spice using nature's medicine cabinet of spices rather than making it spicy as in hot. Try this dish and you won't regret it! You can also make it with large-leafed spinach, spring greens, collard greens, green beans and broccoli for some delicious variations. Blanch the spinach in boiling water for a couple of minutes, let drain and squeeze all remaining water out. Add tomatoes, spinach and coconut milk. Let simmer for approximately 10 minutes until most of the coconut milk has been absorbed into the spinach. East by West tip - If you like this dish, try the Kola Kanda soup (page 48) or Veg Masala for the brain (page 198) in East by West.